On Brew Ha Ha today, Herlinda Heras will call in from the Craft Brewers Conference in Nashville, Tennessee, to speak to Steve Jaxon and Mark Carpenter who are in the studio. Steve mentions that Mark is retired after his long illustrious career at Anchor Brewing in San Francisco and now he has four horses in Petaluma. Herlinda Heras calls in live from Nashville, where she is attending the Craft Brewers Conference. It’s her first time in Tennessee and she loves it. She says it’s so much better than Las Vegas. Steve loves Nashville Herlinda is impressed with the seemingly ubiquitous rooftop bars and the abundance of live music that she hears everywhere she goes. She is at the World Beer Cup awards. Every two years at this annual conference they do the World Beer Cup. They will announce the winners soon. Steve remembers that since the 1950s Nashville has been called Music City. The Country Music Hall of Fame is across the street from Herlinda. There is a conference hall and museum, another rooftop bar with a pool on the roof. Last night she went to Santa’s Trailer Park Pub with Jeremy Marshall, the head brewer of Lagunitas. It’s literally in a trailer park about 8 miles outside of Nashville. They made a bunch of shipping containers into a bar and they did karaoke there. 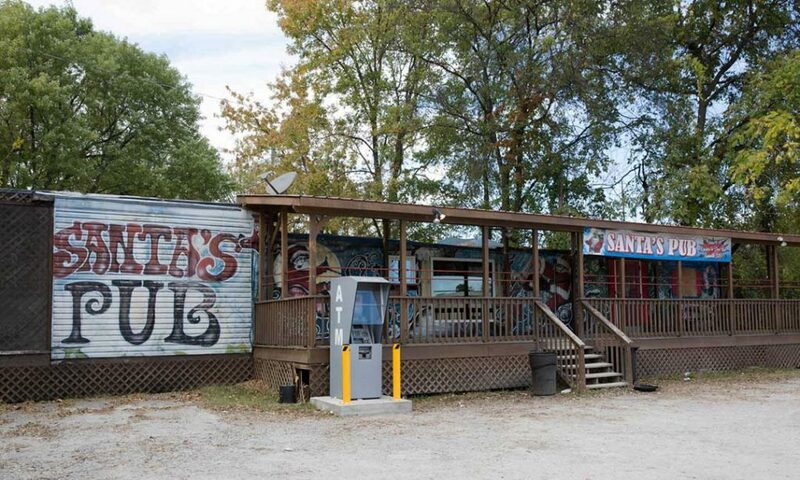 She says it is “thee diviest bar in Tennessee.” Steve says to go to Tootsie’s, it’s where every musician used to hang out. Steve was once a drummer on tour and knows Nashville. Herlinda says Nashville has doubled its population to 2 million in ten years. Steve compares it to Austin, Texas, which he also visited after 30 years and he found it remarkable that the place is completely new now. Now Steve and Mark will talk about some beers that Mark has brought in. 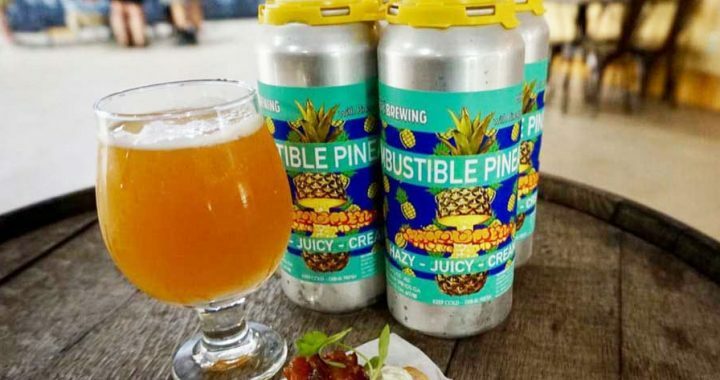 The first one is called Combustible Pineapple from Pontoon Brewing Co. in Sandy Springs, Georgia. Mark got it from his son-in-law who visited Atlanta, otherwise this beer is not available in California. Mark remembers “Beer flavored beer” on the label of the homebrew winner from a few weeks ago. He admires the creativity but he likes the regular flavors too. Mark points out that these creative labels are printed on paper and then applied to the cans, because that is much more cost-effective than printing on cans, which requires a larger run. Steve and Mark also taste another beer from Pontoon, a good hoppy IPA. Steve remarks that their label art is fascinating. Stroh’s Beer was the iconic brand of beer that Steve’s father would drink, back in Detroit. Then they sold to Pabst, which still makes Stroh’s. Mark’s first encounter with Stroh’s was in 1965 and he saw “fire brewed” on the label, which was truly unique. The Stroh family came from Germany in the 1800s, started a small brewery and grew slowly and steadily. The technique of boiling the hops usually uses steam but Stroh’s always had a direct fire on the kettle, which gives a different result. The flame of 600 or more degrees heats the brew a lot more than steam does, giving a bit more caramel and malty flavor.